Bachelor thesis on boating in the Gulf of Finland by Manon Hollink - Sail in Finland! Just received a copy of a very interesting Bachelor thesis on boating in the Gulf of Finland by Manon Hollink. 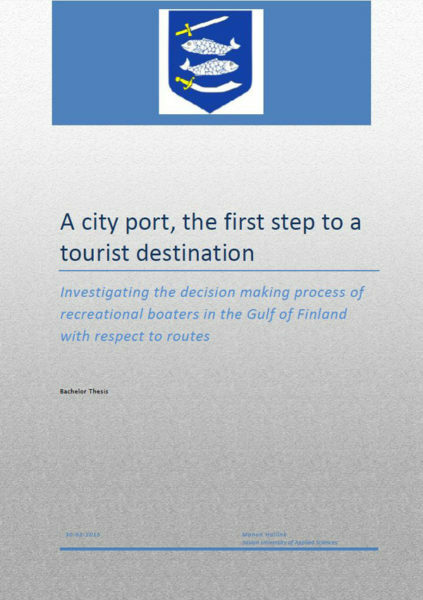 The title of the thesis is “A city port, the first step to a tourist destination – Investigating the decision making process of recreational boaters in the Gulf of Finland with respect to routes“. The thesis has been written at the department of Tourism and Leisure Management at the Saxion University of Applied Sciences in Deventerat in the Netherlands. The customer for the thesis has been the Narva Department for Development and Economy from the city of Narva in Estonia. The objective of the study has been to help the city of Narva in developing boating-based tourism. However what makes Manon’s thesis of much wider relevance is that it is based on a rather large survey of boaters and boater behaviour in the Gulf of Finland. If you are in the boating tourist business in the Baltic and in particular in the Gulf of Finland, you should definitely read Manon’s thesis. What are characteristics of recreational boaters, more specifically recreational boaters in the Gulf of Finland? What are specific features of decision making processes for tourists? What is the decision making process of recreational boaters and more specifically of recreational boaters in the Gulf of Finland? To answer these questions she conducted a survey that was answered by 170 people that had completed at least one boat trip in the Gulf of Finland lasting more than 3 days.The respondents were divided 45/55 between Finns and Estonians. The majority of the boaters did the trip on a sailing boat owned by the respondent (or his/her family). The criteria for planning where to go should send a loud and clear message to cities and municipalities that want to attract boaters: do build good marinas, the facilities at the marinas are the nr. 1 decision criteria when doing route planning as you can see from the chart below. What happens when the boaters arrive at their planned destination? Seems that boaters are still discoverers at heart and have a small Christopher Columbus inside them. This I deduce from the statistics explore the destination city is the most common pastime, tightly followed by discovering local culture and eating out. Activities such as spas, concerts etc were at the bottom of the list to do (see table below). The final observation can be seen in two ways. If you offer boating services, these numbers will probably look low, but if you want to come and sail in Finland and the Gulf of Finland, the cost of sailing here is actually very low, if you look at the daily spend (total/per boat). So as a conclusion, if you are a city or a municipality or a marina owner and operator, the simple formula to attract boating tourists is: make sure you can offer the boaters a nice harbor with good facilities, help the boaters discover the surroundings and make sure the cook gets a free day off and the boat crew a change from the cook’s food! Manon has kindly let me upload the full thesis on Sail in Finland, so if you are interested in the full results, you can download the thesis here! Thank you Manon for a great effort and for letting Sail in Finland publish your results!